Editorial Board’s policy of the Journal is based on current legal requirements with regard to copyright, legality, and plagiarism and libel contained in the legislation of Ukraine, and the ethical principles that are supported by the community of the leading publishers of scientific periodicals. 1.1. The scientific journal “Control Systems and Computers” was founded in 1972 and is a specialized of the theory and practice of information technology and systems, pattern thinking, knowledge processing methods and tools, economic and mathematical modeling. The edition is registered with the Ministry of Justice of Ukraine (certificate of registration of the print media HF 17215 – 5985 PR of 27.10.2010) and the International Centre for ISSN (ISSN Print- 0130-5395, ISSN Online -2518-1262). A special feature of the Journal is a unique combination of materials both theoretical and practical orientation, and besides technical and mathematical problems are considered . The Journal publishes articles in Russian, Ukrainian and English with optional annotations in these languages for each article. 1.2. The Journal is published in printed form six times a year, in edition of 120 copies. Enabling researchers to publish results of their studies, to attract attention to the most relevant, interesting and perspective areas of research in the modern world level, increasing the availability of the exchange of knowledge and professional experience among researchers from different regions and countries. The target audience of the Journal are domestic and foreign experts in physico-mathematical and technical branches of sciences; research staff of research institutions, teaching staff of universities; doctoral students, graduate students and students of Ukrainian and foreign universities and scientific groups. The journal publishes original full-length articles. Current events, conferences, exhibitions, letters to the editors, discussions, new books. 2.1. The journal publishes original research papers in which the results of research in the theory and practice of information technology and systems, pattern thinking, knowledge processing methods and tools, economic and mathematical modeling. 2.2. Copyright materials are provided according to the manuscript preparation. 2.4. Directing the article to the Journal, author expresses thereby his consent for the publication of his article, and confirms this in writing form (according to the form of the consent of the author/s in the publication), on the publication of the article in open access on the official website of the Journal, the transmission of the text article (including references, bibliographic information, etc.) in domestic and foreign scientometric base. 2.5. Editorial Board edits all incoming manuscripts in accordance with the requirements for publication of scientific literature and ethics publications. To maintain a high level of scientific publications Editorial Board reviews all articles (internal – a member of the editorial board, and external review), which allows to select the papers that contain significant scientific results, taking into account the experience of foreign scientists and the interest to the international scientific community. The stuff of the reviewers includes both foreign and domestic experts on the scientific directions of the Journal. The author is given the written text of the review (without the reviewer’s surname) or the copy of the manuscript with the comments of the reviewer and scientific editor for further rework. When publishing articles specify the date of its receipt. 2.6. The decision on the publication of materials is accepted by the Editorial Board, which may take an article for the publication or to recommend the author to modify it or to reject an improperly designed materials. 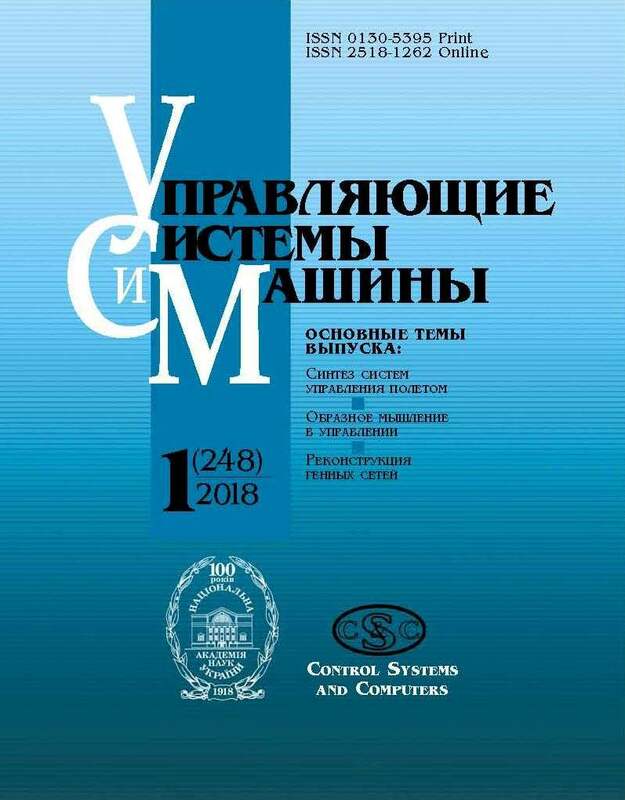 Each issue of the Journal is approved at a meeting of the Academic Council of the International Research and Training Centre for Information Technologies and Systems of NAS of Ukraine and MES of Ukraine. 2.7. The editors reserve the right to make editorial changes and the reduction of the manuscript. Accepted for publication articles pass necessary editorial treatment. 2.8. Copyrighted materials posted in the Journal reflect the personal views of the authors, which may differ from the point of view of the publisher. 2.9. Despite the high requirements to published materials, the Editorial Board adopts a policy of support for young authors. 2.10. The fee from authors is not charged. Royalty for the publication of articles is not charged. The recommendations of The European Association of Science Editors (EASE). 3.1. Editorial Board’s policy of the Journal is based on current legal requirements with regard to copyright, legality, plagiarism and libel contained in the legislation of Ukraine, and the ethical principles that are supported by the community of the leading publishers of scientific periodicals. immediate reports from the author about significant errors or inaccuracies in the publication and interaction with the Editorial board for an early correction of errors or exceptions publications, timely correction of errors and discrepancies identified by the editors. 3.3. Authors of the materials are fully responsible for the accuracy of the information contained therein, for materials compliance standards legislation, morality and ethics. 3.4. The Editorial Board is not responsible for the professional and substantive and methodological correctness of published materials, as well as for correctness in the text of links to online resources and references. 3.5. The Editorial Board does not allow the publication of materials, the content of which is prohibited by the legislation of Ukraine. The editors do not allow in a Journal or copyright materials posting links to pages that infringe the legislation of Ukraine. 3.6. The Editorial Board does not publish materials with the character of belittling the honor, dignity and business reputation of any person, including private individuals, organizations, government agencies. 3.7. The Editorial Board does not publish materials that contains profanity. – Scientific Electronic Library eLIBRARY.RU Russian Federation (http://elibrary.ru). 4.2. Copyright materials, with the exception of information materials, placed in the Journal, owned to the authors or to the Editorial Bord. 4.3. The reprint of the journal material in other publications admits in agreement with the Editorial Board, if there is consent of the author. In the case of citation (partial use) text journal materials, the reference to the Journal and the author is obligatory. 4.4. In the case of writing a new, creatively independent papers which are based on articles published in the Journal that quote or translate fragments of articles for the purpose of citation it is necessary to refer to the original sources in compliance with the rules of citation. Editorial Board urges to use specifically proposed for such cases the bibliographic records for articles posted at the end of each article in Russian and English.